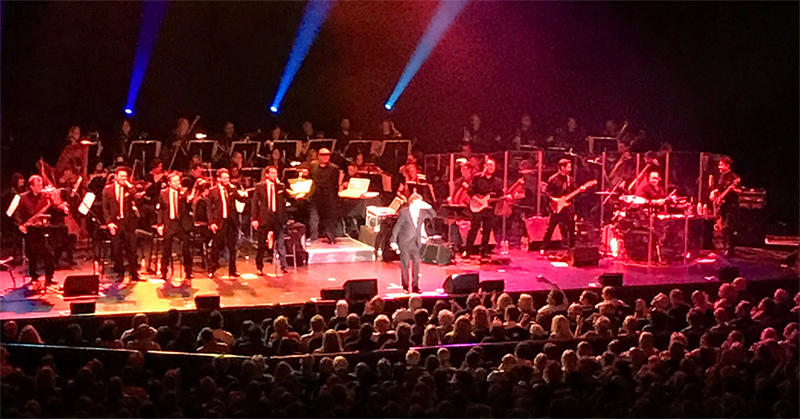 During the 2017-18 season, we had the pleasure of hosting two sold-out Frankie Valli & the Four Seasons performances. It was a historical moment for our venue, as the iconic Jersey Boy set a new record at Ruth Eckerd Hall, performing 30 times on the main stage in a 35 year span. Since Ruth Eckerd Hall is one of Frankie’s favorite places to perform, we wanted to make this experience special for him and his fans. Along with the Four Seasons, Frankie was backed by a full 32-piece symphony orchestra on both nights. What a breath taking show, the crowd literally could not take their eyes off of this magical moment. The orchestra really took it home, performing all the crowd favorites including Working My Way Back to You, Sherry and My Eyes Adored You. There were a lot of exciting moments from both nights. In our grand concourse we created custom “Frankie Valli Alley” road signs as a photo opportunity for fans. 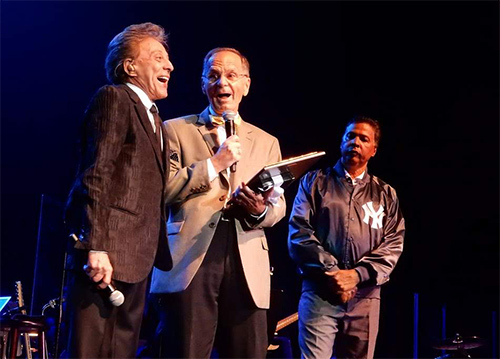 During the show, Frankie was honored with gifts and proclamations from public figures within the Tampa Bay community: Jon Gruden sent a signed Oakland Raiders cap, Hooters presented him with his own VIP card in the name of “The Real Frankie Valli", and Clearwater Mayor George Cretekos presented Frankie Valli with a key to the city. Representatives from the New York Yankees – special adviser Ray Negron, baseball legends Willie Randolph and Ron Guidry presented Frankie with a framed Joe DiMaggio jersey, one of his favorite players. 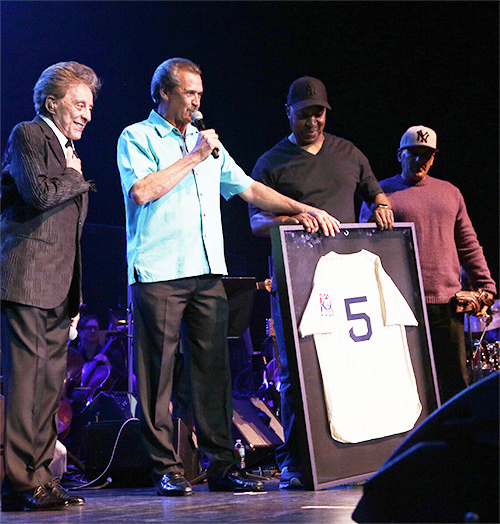 Negron is a huge Frankie Valli fan and has accompanied countless coaches and players to meet Valli at Ruth Eckerd Hall, from Joe Torre to Don Zimmer to Darryl Strawberry to Wade Boggs. 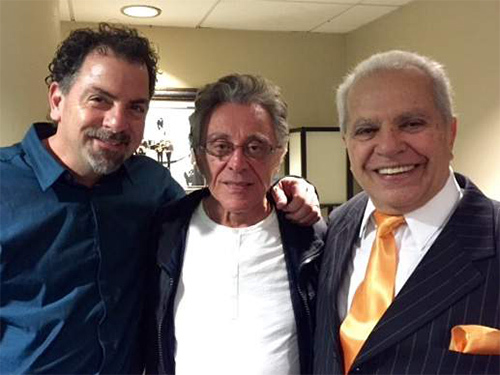 In this photo: Frankie Valli, Mayor George Cretekos and Ray Negron. In this photo: Frankie Valli, Ron Guidry and Willie Randolph and team representative. There was even a real “Doo-Wop” legend in the crowd, one of Frankie’s longtime friends, Joey Dee was in attendance. "Frankie never forgets his friends or where he came from," Dee said. "I haven’t seen him since probably last year, but when we get together, whether it’s at the restaurant or backstage after the show, we’ll pick up the conversation just where we left off. It’s a wonderful relationship, and he never forgets to mention I’m in the audience at Ruth Eckerd Hall when he’s on stage. He gives me a heartwarming, fabulous introduction to all my neighbors and friends. It warms my heart. It really does." Ruth Eckerd Hall is honored to hear that Frankie Valli calls the city of Clearwater his “second home”. 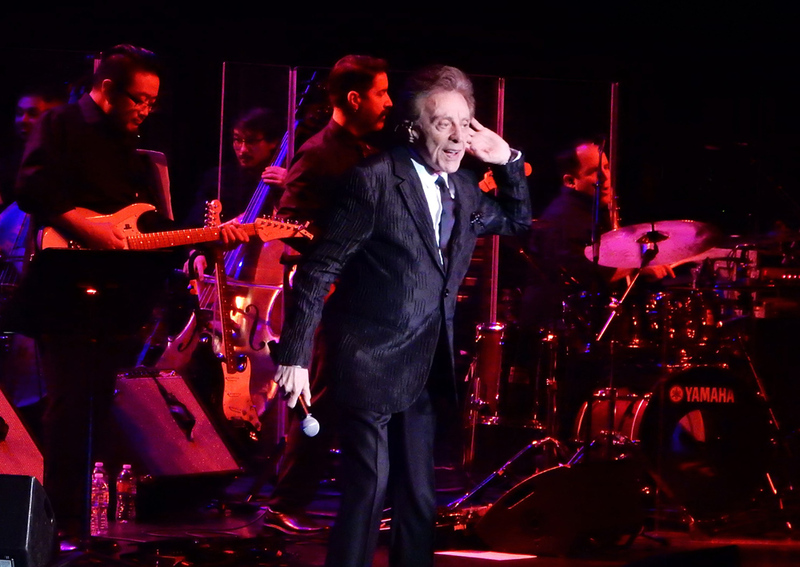 He’s granted us with his vibrant energy and larger than life stage presence for over a generation, and we look forward to celebrating Frankie Valli’s music for years to come. 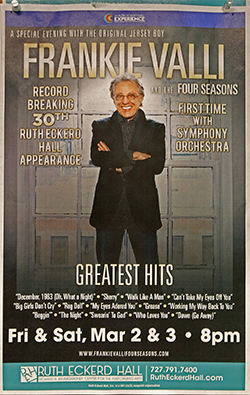 Frankie Valli holds the record for most all-time performances at Ruth Eckerd Hall (30). Johnny Mathis and Engelbert Humperdinck are tied for second in most REH performances for a single artist (28).